1) boot via "Try Lubuntu" not "Install Lubuntu"
This workaround works only if the unsafe swap error has not been raised since the last reboot. If that has been the case even with swapoff --all the installer will fail, to circumvent reboot. I'm getting the same with Lubuntu 14.04 installing onto a fresh unformatted virtual disk in virtualbox. Same error. It only occurs when I attempt to encrypt my home directory. Unencrypted, the installation goes without an error. I notice that I have a one MB reserved space at either end of my disk memory. Nothing I do will get rid of these partitions. I assume they are the problem. Gpart doesn't remove them but gives me an error instead. If I insist on trying again, it locks the computer up and I have to do a hard reboot. My disk was originally an uninstalled new purchase Windows 7. I refuse to use that product for security reasons and am attempting to replace it with Lubuntu 14.04. Looks like Microsoft is reaching out from the grave to make sure their security problems stay with me evey when I don't use their software. The computer is a refurbished (by Acer) Acer Notebook NX.V7EAA.009;TMP653-M-9889. It does have hardware TMP. I also tried to execute swapoff --all but that didn't work either. Terminal, enter: "sudo swapoff --all"
Remember, it must be run as sudo(super user) to disable swapoff. It's the ordering. 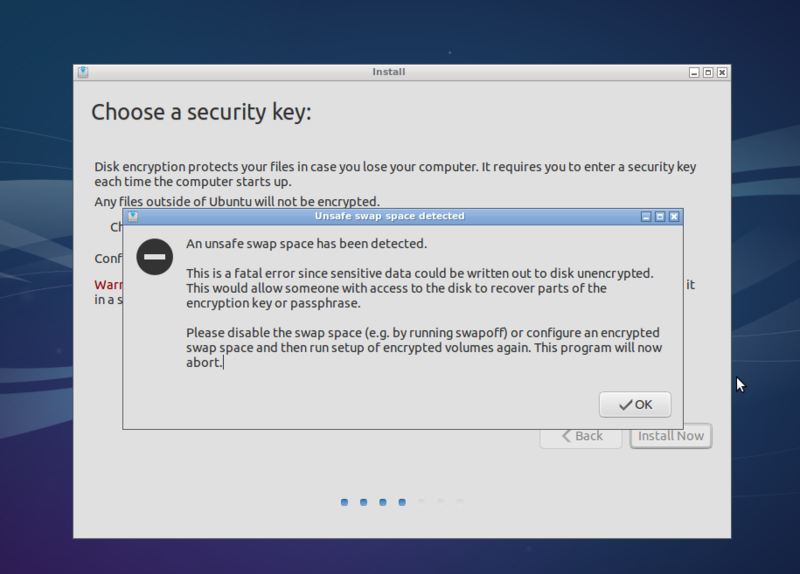 It can't cope with setting swap as an encrypted partition and then creating another partition after that. So, set up all your actual partitions, including your encrypted containers first. I believe it necessary to include an encrypted partition for swap, so make sure to make one of suitable size for it. Don't know if relevant, but I happened to pick all logical partitions and that worked. Once you have them all set up, THEN, and only then pin them to actual mount points (setting this straight away will result in a crash). I started with swap and then moved on to /home and so on. Now you have your encrypted partitions, and you don't have to forgo swap with swapoff! Same bug still exists in 14.10, the workaround from #8 is what I used to complete install. Yes, I ran into this problem again when attempting a install of 14.10 using my (encrypted) 14.04 partitions. Very frustrating since it takes 5+ minutes per iteration after you quit and try something different. The problem seems worse -- I tried at least 5 or 6 different variations before finally being able to complete the install. Even though I would run "sudo swapoff --all" (from the terminal, from a virtual console), I'd still get the error. I tried deleting my existing partitions and creating new partitions. The problem seems worse (or perhaps it's an additional problem) -- there were several times that I was trying the approach from comment #11 and not setting mount points until the end, but then the problem was that after I created one physical volume for encryption, the installer would hang when I created the second. (One partition for swap, one for /, in addition to the unencrypted /boot partition). Still there in Lubuntu 15.04. I'm running into this on Lubuntu 16.04.1 too - i386 and amd64 desktop ISOs (downloaded yesterday). Tried on multiple machines with the same results, but the workaround fixed the problem. The error message is: "An unsafe swap space has been detected" (I couldn't find this bug by copying + pasting the message). This seems like a major bug to me - users can't install using one of the options presented to them unless they run a terminal command manually. I consider myself to be an advanced user and I managed to find the workaround via a blog post, but I suspect people with less experience will give up. Is there a way of getting the bug importance increased (I don't think Medium fully conveys the seriousness of "I can't install Lubuntu using the wizard") and is there anything users can do to help get this fixed? Is this bug already present on Lubuntu 16.04.1 and if yes what is the best way to solve it? PLEASE, dear Lubuntu Team, would PLEASE fix it? I would appreciate this very much. If necessary and you tell me someone who can do this, I would be willing to pay for the bugfix. Hard disks should not be used unencrypted, but this bug FORCES every normal user to do so! Installing without encryption is the ONLY thing a normal user can do! 1. Restart your computer and choose test Lubuntu (without installation). 2. In the program menu, find the program LXterminal (in German: you can find it in "Systemwerkzeuge"). 3. Type "sudo swapoff -all". 4. Only then click the icon to install Lubuntu. Encrypted installation should work now. Please note: The restart is necessary, the system must be "clean". I'm getting the same with Lubuntu 16.10 installing onto a fresh virtual disk in virtualbox. Same issue with 16.04 AND 17.04 and it does not work even with "sudo swapoff -all". Tried lubuntu-17.04-desktop-amd64.iso on a lenovo yoga 300 several times using "sudo swapoff --all" before running into error. Thus the error message changed to auto-partition failed. At my system the auto-partitioning creates a 1MB partition as first an one as last partition on disk, which is quite odd. I found a forum hint pointing out that the result of auto-partitioning would be the cause for the resulting error. My expertise is not sufficient to manually create the needed partitions using gparted and getting the installer using these partitions. Thus I am not able to use the 64-bit Version of Lubuntu. This is a pitty as the installation of 16.04 on 32bit ASUS eeePC 901 runs like a dream. Which was the trigger for trying to switch from ubuntu to lubuntu with the yoga . I booted using 17.04 64 bit and did choose the "Try Lubuntu" option from the boot menu. From the desktop I have chosen "start menu" -> "system tools" -> "LXTerminal"
After completion I started the installer icon from the desktop and the installation ran smoothly. Perhaps this part of the solution does help someone else. Good Luck! I am pretty fed up by now. Perhaps I might come back at a later point in time. Bye for now. Indeed, for now the solution will have to be to disable zram before installing for LVM2 with crypto. So; for zram, I think the solution will be "involved". Not overly complex, but I think it needs a small rework of seeds. zram is compressed, not encrypted. It would be downright wrong to ignore zram devices when checking that swap is safe when dealing with encrypted disks. One option is to allow users to decide whether it's fine, but that seems like pointing them in a direction that might not be in their best interest -- it's not obvious enough this way that we look whether swap is safe for a good reason: if you keep unencrypted swap enabled, you still have unencrypted data in memory that may contain the data you're trying to secure with disk encryption. The other option would be to install zram later, once we know the system is not going to be installed with crypto. To get that, we'd need to move zram-config from live-share to ship-live-share so it still exists on the CD, but in the pool/ directory rather than as a part of the live image; and add some code in ubiquity to that if you install without crypto, for lubuntu it would install zram-config. You wouldn't have the error if the live image didn't have zram-config in the first place. In fact, I think having zram-config in live potentially slows things down -- if you're in the live session, you're already running in memory and not swapping to disk (the point of the live image is not to change the local disk), so having zram only seems to me to be adding compression overhead. Late install of zram-config probably ought to be done somewhat like for language packs, so in scripts/plugininstall.py for instance, possibly install_extras() with the appropriate guards to install on Lubuntu, and only if LVM2-crypto was not the partitioning mode. Setting the ubiquity task to Triaged. I don't think I have the time to do this right now, but I think I've captured by idea here and given sufficient background that someone else could easily attempt to implement this in ubiquity -- that would be a pretty interesting way to get to know ubiquity, too. FWIW, the unsafe_swap check is done in partman-crypto -- that's a debian-installer component, so another reason to avoid making flavour-specific / security-sensitive changes there. Please provide a possibility that when this warning is prompted, the user can disable all swap with a single click and, if needed, is navigated back to the install screen most suitable to restart with. No, it wouldn't. This is exactly the solution that is needed. > you're trying to secure with disk encryption. in ram anyway, and is thus already vulnerable to such attacks without zswap.